The status of the Office of Planning Advocacy (formerly the Office of Smart Growth—and before that the Office of State Planning, for those keeping score), as well as the entire state planning apparatus, has been in doubt for years, stretching back to the Corzine administration. 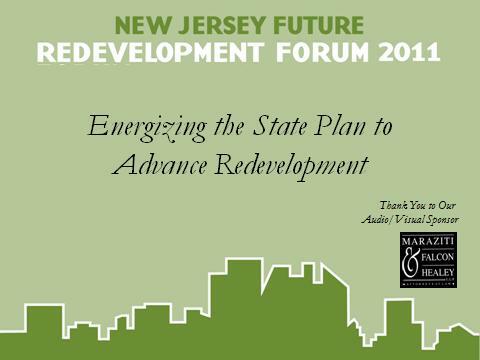 (See our Future Facts on the subject, State Planning: A Picture of Neglect, from September 2009.) Now, for the first time since taking the helm of the Office of Planning Advocacy, Gerry Scharfenberger spoke publicly last night about the direction of the office, and what its priorities will be in the Christie administration. Among the topics he addressed were the status of the State Development and Redevelopment Plan, the future of Plan Endorsement and the relocation of the office from the Department of Community Affairs to the Department of State. He gave the remarks at a meeting of the Somerset County Planning Board. Not surprisingly, economic development was a major theme of Scharfenberger’s remarks. Indeed, the office’s location in the Business Action Center in the Department of State belies that same focus: creating jobs. To that end, Scharfenberger spoke of efforts by his office to map all of the Redevelopment Areas in the state so they’ll be searchable by businesses looking to relocate. He also spoke of conversations he has had with Governor Christie about the importance of redeveloping urban areas where transportation and infrastructure already exist, and noted the role that solar farms could play in returning brownfields to productive use, citing a recent example in Gloucester County. 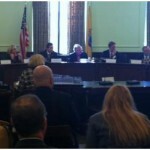 Scharfenberger touted the fact that the State Planning Commission has finally achieved a quorum for the first time in the Christie administration through appointments of members of the executive branch (avoiding the need for Senate approval), which he considers an early accomplishment of his tenure. The reconstituted commission (which still lacks public members, who require Senate approval) will focus on clearing the backlog of Plan Endorsement petitions, mapping changes and other perfunctory tasks, he said. As for the larger role of the State Plan, Scharfenberger offered few details. He hinted that the administration would look to change certain elements of the plan, which he characterized as “too housing-centric,” but did not indicate whether it would start over from scratch, or work to amend the existing draft (which has yet to be formally adopted by the commission). On the subject of Plan Endorsement, the process whereby municipalities have their local plans “endorsed” by the state for conformance with the State Plan, Scharfenberger was more direct. He called the process “cumbersome” and “a burden on towns, “noting that, as mayor of Middletown, he had direct experience with Plan Endorsement and is “not a big fan.” He observed that towns are being asked to do more and more to achieve endorsement at a time when state incentives are shrinking. Endorsement should be rethought, he said, or at the very least streamlined to make it easier on municipalities. He offered no further details, however, about what the process should look like, or what it would hope to achieve. He said his office plans to see through all of the existing endorsement applications–in fairness to municipalities that have entered the process–but that it would not be accepting any more applications until further notice.